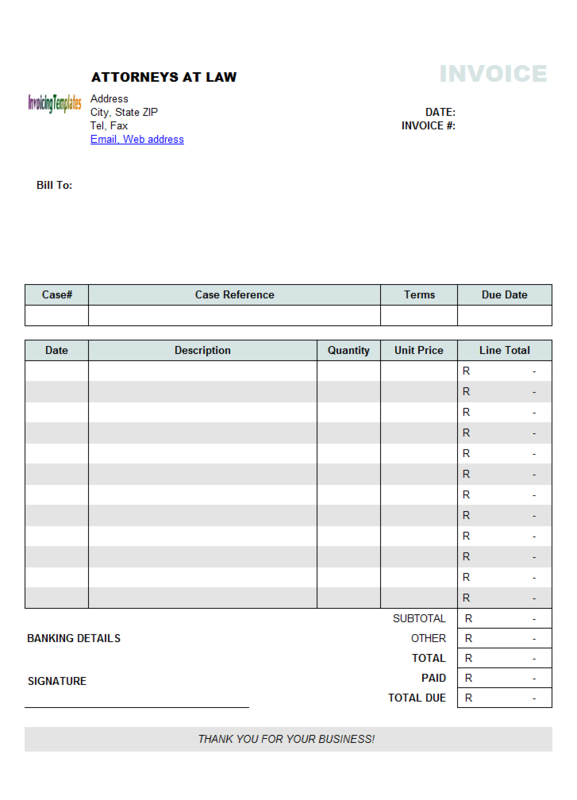 Invoices are business documents, and they should be beautiful and professional like the other business documents. 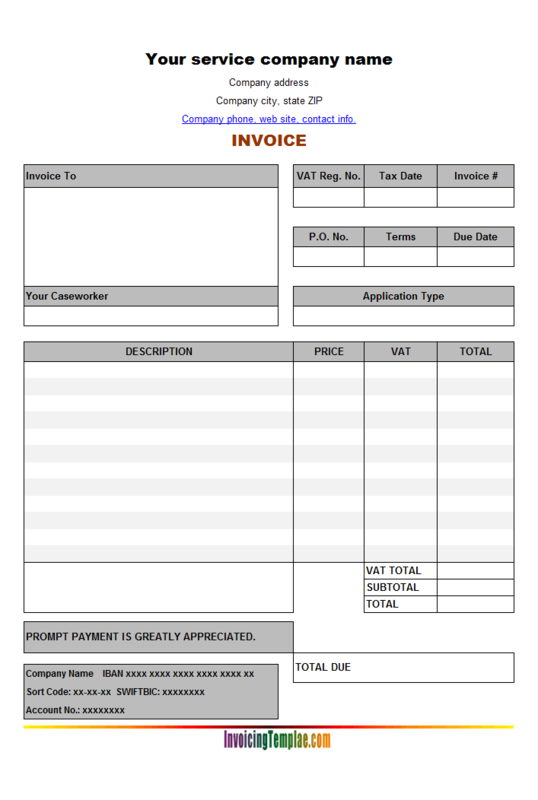 Beautiful Service Invoice Template with Hourly Rate is a sample invoice created based on c4025 (Hourly Service Billing Format) . 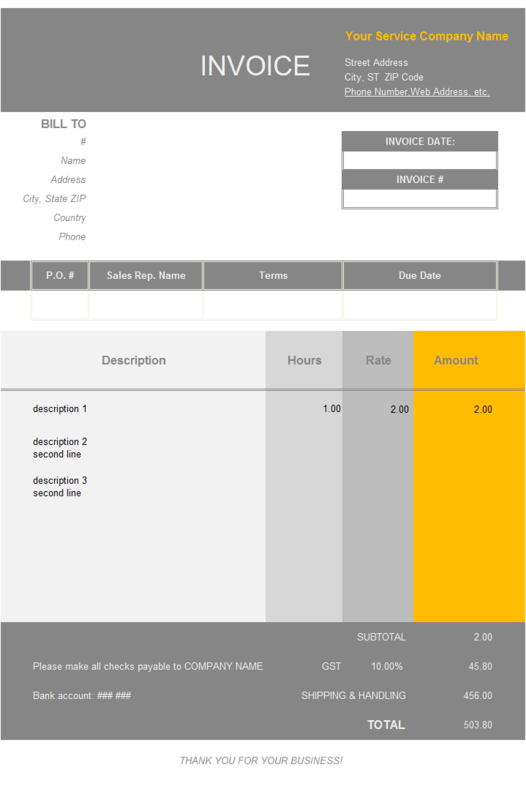 c4027 now includes the customized invoice template for the latest version of Invoice Manager for Excel. This is what you will see when you open beautifulhourly.xlsx. We all know that it is easy to set text fonts, colors and style in Microsoft Excel. 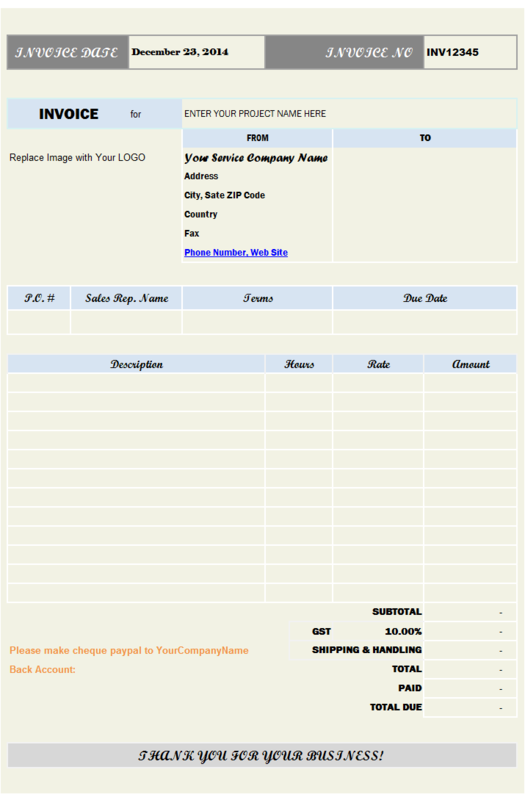 Some simple customizations could make your invoices standout from the others. First, a properly designed invoice can increase your level of professionalism. An invoice is a document that will let your clients know about your expectation and a means to make sure that you will be paid on time. With this in mind, it's very clear that having a good template will surely send the signal that you really mean business and you put great importance on even the smallest details of your business. 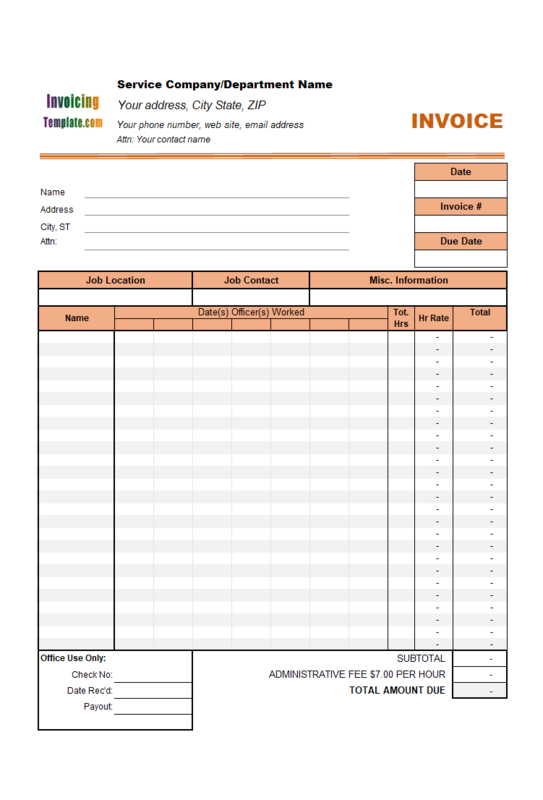 Of course, creating your own template can be time consuming and even a daunting task. 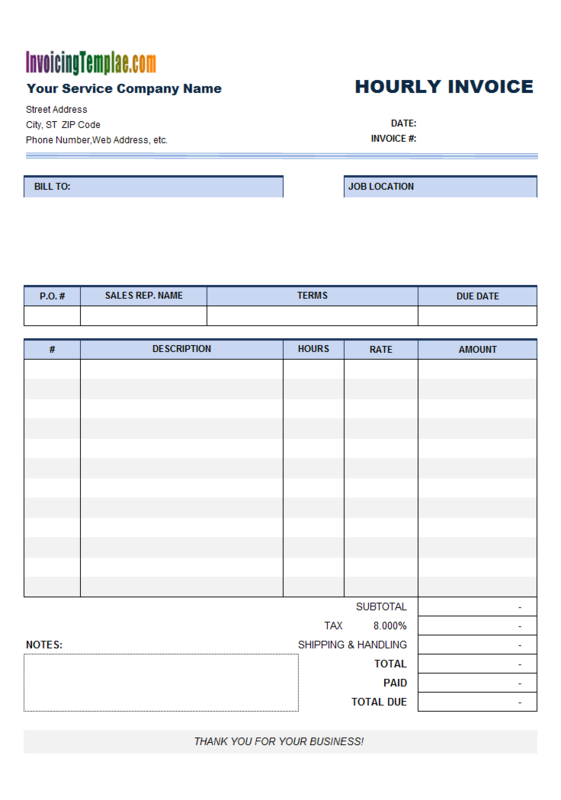 With this sample designed by InvoicingTemplate.com, we use simple Excel tools, such as fonts, colors to make the original invoice format - c4025 a completely different look and feeling. 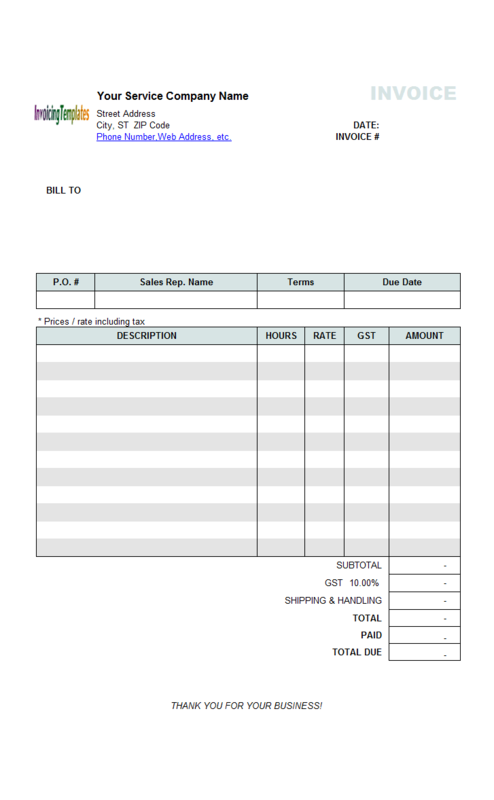 This free billing template has the background of invoices set to Tan, and most important text labels, such as "INVOICE", are using the "Script MT Bold" font. This font should be available on most Windows systems. And, if you prefer to change it, it is easy - simply unprotect the spreadsheet, and then select the text you want to change the font for, and then choose new font from the Excel ribbon. 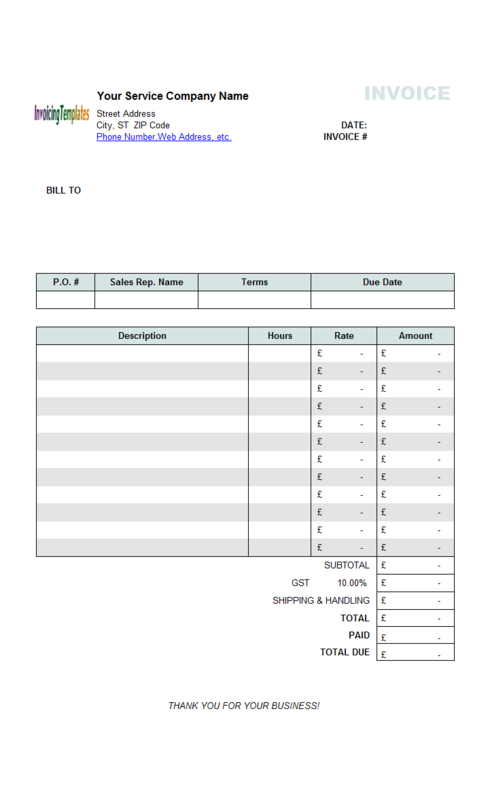 We've also moved the cells to create the new invoice layout, as compared to c4025 Template. If you want to make the simple template a complete invoicing system, Invoice Manager for Excel (namely Uniform Invoice Software) could help. 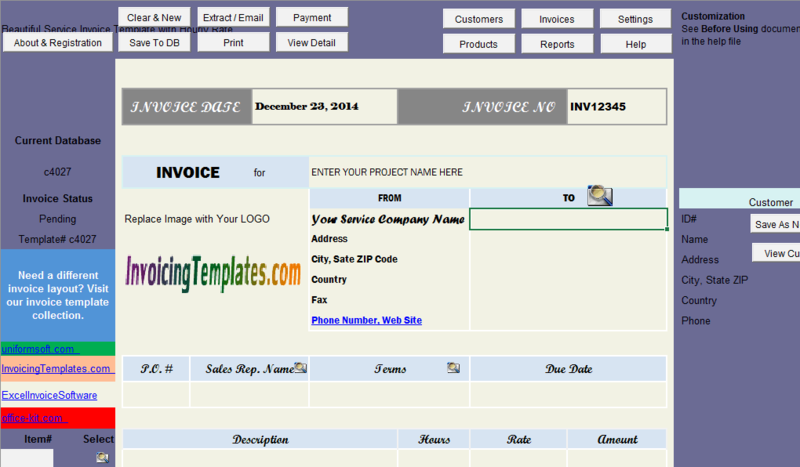 InvoicingTemplate.com offers various free invoice templates that could all be used with Invoice Manager for Excel (namely Uniform Invoice Software). 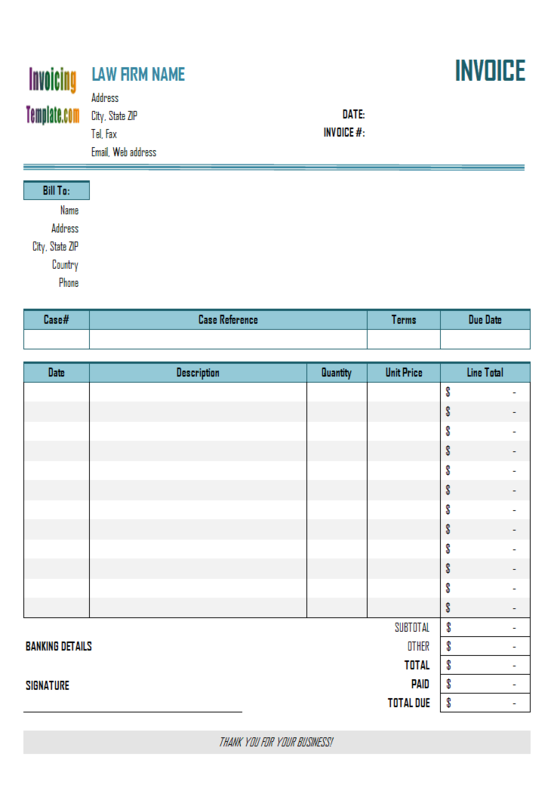 The previous sample template, c5068 Hourly Service Billing Template (Price Including Tax), is also based on Hourly Service Billing Sample, and also added a new Tax column. However with c5068, the prices include tax. With c5069 Hourly Service Invoicing Sample (Price Excluding Tax) or Hourly Service Billing Statement (Price Excluding Tax), the definition of prices include no tax. If you want to change the currency symbol of these hourly service billing samples, see c4026 Hourly Service Bill (UK Currency). 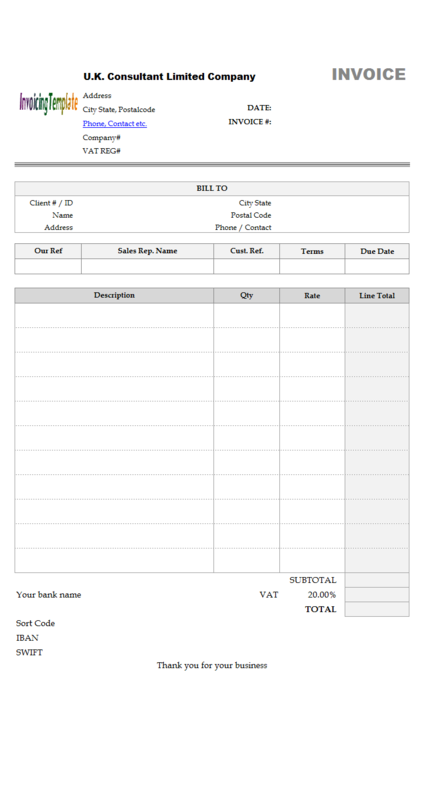 The VAT templates are also available here on InvoicingTemplate.com. 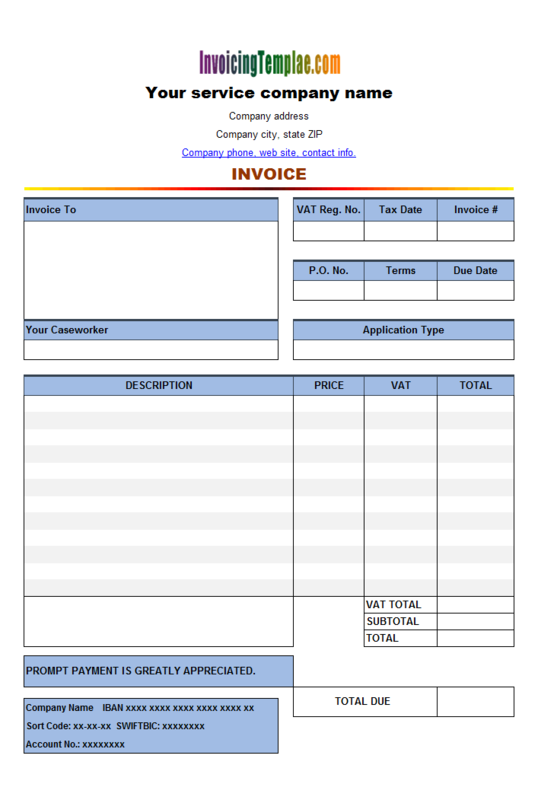 A VAT sales invoicing template is also available here on InvoicingTemplate.com, at c6007 VAT Sales Billing Sample - Price Including Tax. 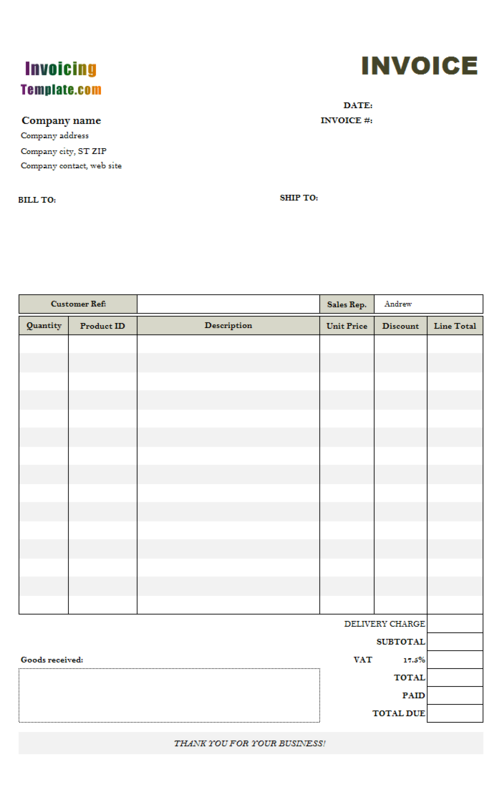 The VAT service bill template is located at c6013 VAT Service Bill Template - Price Including Tax. Or, the sales VAT version where the prices excluding taxes, is located at c6008 VAT Sales Invoicing Sample - Price Excluding Tax. Or, the service VAT version where the prices excluding taxes, is located at c6014 VAT Service Invoicing Sample - Price Excluding Tax. 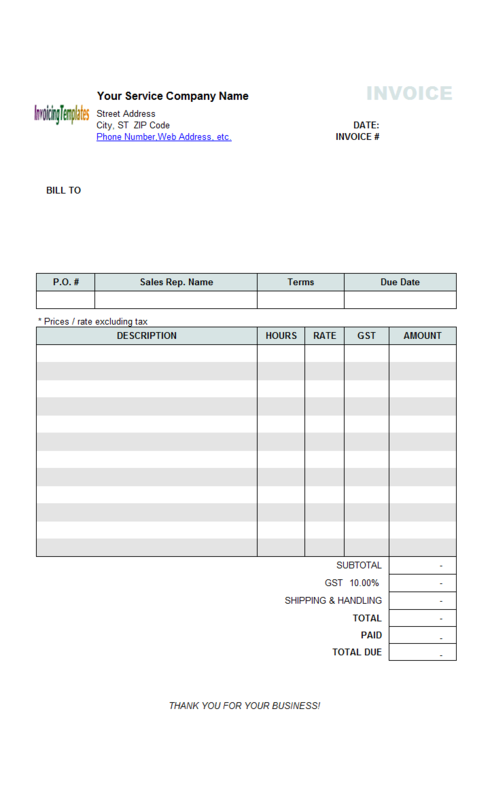 The templates with 6 columns on the printable invoicing form show both the tax rates and tax amount. 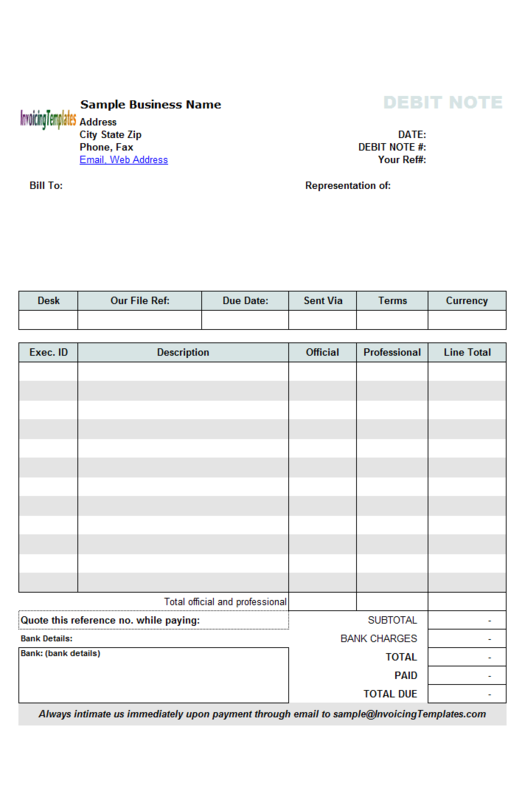 Like other form designs here on InvoicingTemplate.com, Beautiful Billing Template with Hourly Rate is free (offered to you at a price of 0.00USD). It works on Windows XP and all newer versions of Windows, and Excel 2007, 2010, 2013 or 2016.